The risks of childbirth for both mother and baby in earlier centuries are plentifully demonstrated in many areas of the manuscript and printed collections. The illustration of a woman giving birth, tended by a midwife and female supporters, appears in 'De Conceptu et Generatione', by Jacob Rueff. In the woodcut, astronomers are drawing up an astrological chart for the new child. 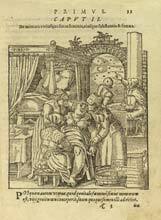 This study, which was published in 1580, was one of the earliest textbooks on midwifery. A copy is held in the Medical Rare Books Collection. 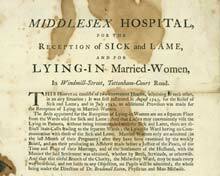 A charitable appeal for the Middlesex Hospital shows that by the mid-18th century qualified medical supervision was available for married women in childbirth. This valuable service was used by only 174 women during the year 1754-1755. The majority of babies were born at home, with only a local midwife (of variable skill and experience) in attendance. Such ephemeral publications and notices often survive only by chance, in family archives or as part of a local publication. 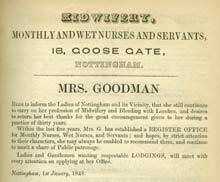 Mrs Goodman's advertisement for her midwifery business appeared, for instance, in a Nottingham trade directory of 1848. The emphasis she places on the good characters of her staff reflects public concern over cases of drunkenness among carers and their neglect of infants.